It is worthwhile to look back over the period 1962 to 1980 which is the period that the evergreen MGB was in continuous production at Abingdon. Introduced at the 1962 Motor Show the MGB cost a mere £949 15s 3d and had a top speed of around 108 mph and a 0 to 60mph time of 12.1 sees. With its three main bearing 1798cc engine developing 95 bhp @ 5,400 rpm the MGB was a good performer with plenty of torque throughout the range and was overall a more flexible car than its predecessor, the MGA. 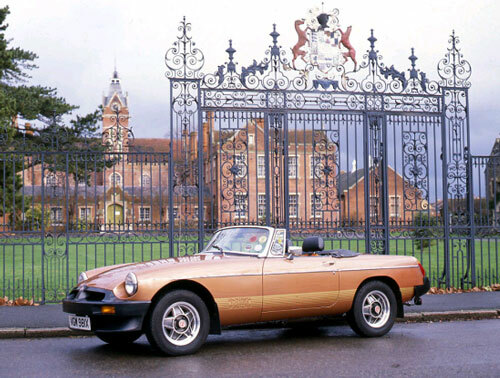 The MGB LE announced in October 1980 alongside the GT LE version went on sale at £6,108 with the GT at £6,576. The top peed had changed little in 18 years with a quoted reduction to 105 mph and a 0 to 60 mph time that remained the same. Maximum power quoted to DIN standard was 97 bhp @ 5,500 rpm. In the intervening years there were numerous modifications to the MGB, some minor, some major. Although the basic body shape remained totally unaltered most of the production changes were cosmetic but some centred on mechanical improvement and as a guide to the evolution of the MGB it would be appropriate to list the main changes and improvements that have taken place over the years. EX 205 as the MGB was codenamed by Abingdon, went into production in May 1962 and had a four speed, three synchromesh non-overdrive gearbox mated to a three main bearing 1798 cc engine. The first change to specification was the option of a Laycock overdrive in January 1963 to be followed by the availability of a factory hardtop in June. Closed circuit crankcase breathing was introduced in February 1965 to be closely followed by a change to a five main bearing engine. An oil cooler now became standard equipment which was available as an option previously. At the same time the dynamo driven rev counter was replaced by an electronic variety. In March 1965 the fuel tank capacity was increased from 10 gallons to 12 together with a change from pull-type door handles to push button, this coincided with the door locks and internal door mechanisms being altered. In October 1965 the closed coupe version, the MGB GT was announced and this was fitted with a stronger Salisbury type rear axle as opposed to the banjo type. This improvement was not seen on the Roadster until April 1967. In October of the same year the Mark II version was announced with the following mechanical improvements: dynamo changed for alternator with negative earth electrics, pre-engaged starter to replace the bendix type and a full synchromesh gearbox was fitted. At the same time the transmission tunnel was enlarged to accommodate the now optional Borg Warner automatic transmission. The American market cars now differed to meet more stringent regulations and had emission control equipment, dual circuit brakes and energy absorbing steering columns fitted. The MGC arrived in 1968 and during this year the MGB had changes to the rear axle ratios on both overdrive and non-overdrive cars to be followed in 1969 with a standard closer ratio gearbox. On the export cars Rostyle wheels were fitted as were reclining seats. At the latter end of 1969 the MGB appeared for the first time with a 'British Leyland' badge adorning the front wings. 5 stud Rostyle wheels were standardised with optional wire wheels available. The unpopular recessed front grille with narrow plated surround and vertical black slats was fitted at this time together with a smaller flatter spoked steering wheel. The horn push was now stalk mounted. Leather seats gave way to the reclining vinyl covered variety. From late 1970 the overriders now had black rubber facings and the bonnet and bootlids had telescopic stays fitted. A new Michelotti designed foldaway hood and improved heating and ventilation completed this years improvements. In October 1971 the Mark III saw yet more changes to the interior with a new centre console and armrest and the radio aperture moving to the console. Fresh air vents now occupied the old radio aperture. Rocker switches replaced toggle switches and a collapsible steering column was introduced now on the UK cars. A year later the front grille is again revised with the MG badge much more prominent set in a chrome surrounded honeycomb plastic mesh. Black wiper arms and blades, door arm rests and a new leather bound steering wheel with slotted spokes, together with a cigar lighter were introduced. The MGB GT V8 was launched in August 1973 and in September 1973 the underbonnet layout of the MGB was commonised with the V8. Radial tyres now became standard and the automatic gearbox option was withdrawn. Servo assisted brakes were now standard together with hazard warning lights. Then in September 1974 came the most radical of external changes with the introduction of the black impact absorbing polyurethane bumpers front and rear with the front incorporating the grille and indicators. The ride height was raised 1V2" to meet US safety legislation. A single 12 volt battery replaced the twin 6 volt batteries. In June 1975 Laycock LH overdrive now became a standard fitment and from August 1976 the suspension was modified with thicker front anti-roll bar and the addition of a rear one. The steering became lower geared and radiator cooling was now by means of a thermostatically controlled electric fan. Overdrive was now selected by gear knob mounted switch and Halogen lights were fitted as standard. The interior was yet again redesigned with striped fabric seats and carpets were fitted throughout instead of rubber matting. The MGB carried sunvisors and the hood now had a zip-out rear window. A new console housed a clock and illuminated switches and an 'H' pattern padded steering wheel. Petrol tank capacity was now reduced to 11 gallons from 12. From late 1977 there was an option of Triumph Stag type wheels with 185/70 tyres and inertia reel seat belts were standard. In January 1978 twin radio speakers were mounted in the door panels. Finally the last 1000 MGBs were produced and completed in October 1980 and designated the Limited Edition. The LEs were fitted with front chin spoilers and the distinctive Stag-type alloy wheels. Wire wheels were an option on the roadster version and the car was finished in bronze metallic paint with gold LE stripes running the length of the car bodywork. The interior was upholstered in orange and brown striped cloth trim and this last of the line MGB carried a price tag of £6,445. A total of 420 Roadsters and 580 GTs were made before the closure of Abingdon and the last of each model now resides with the Heritage Trust alongside their famous collection of historic vehicles at the Heritage Centre, Gaydon. Valve operation: overhead operated by tappet pushrods and rockers. Power output: 97 bhp at 5,500rpm. Maximum Torque: 105 Ib/ft at 2,500 rpm. Brakes: Hydraulic with servo assistance, front 10.75" dia disc, rear; 10" dia drum. Acceleration: 0-60 mph: 14 secs.